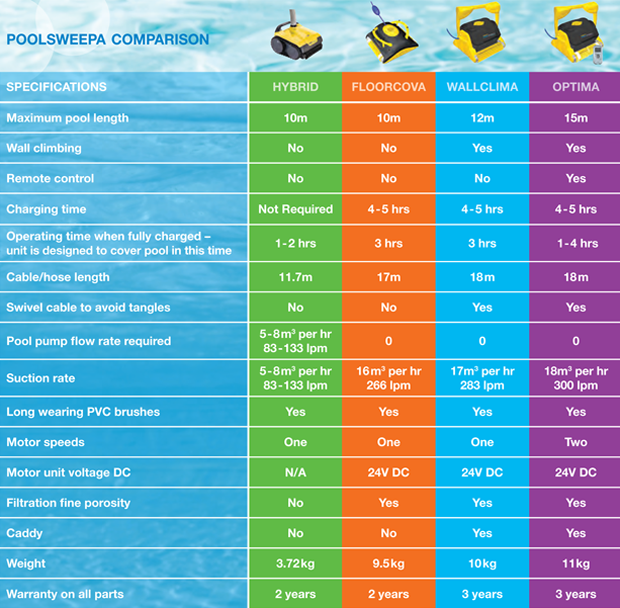 Davey PoolSweepa Wallclima Robotic Pool Cleaner Cleans Pool Floor, Walls And Water Line With The Price Point Advantage Of The Single Speed Motor, That Converts From 240v To 24v Dc For Minimal Running Costs. Wallclima Requires No Connection To Pool Systems, And Its Environmentally-friendly Cleaning Process Means You Require Less Chemicals. It Scrubs, Brushes, Vacuums And Filters To Prevent Germination Of Algae And Bacteria. Wallclima’s advanced scanning programme maps the pool surface contours and obstacles, and efficiently cleans the floor, walls and water line over a series of passes. The competitor model at right has tracked less passes over the pool surface, which results in missed surface grime.